One of the most difficult components of an effective rounding program is getting buy-in from the staff that will be out on the floor performing the rounds. Nurse managers have many fires to put out every day and caring for patients with multiple and unique needs takes a great deal of focus. A rounding process needs to be efficient and easy for staff to collect data, identify problems and solve them. Getting nursing to buy in to this process is essential. Without that understanding, you may see scenarios where there are positive rounding results, but poor Hospital Consumer Assessment of Healthcare Providers and Systems (HCAHPS) scores. The discrepancy in the data provided by internal rounding and HCAHPS results reinforces the value of getting buy-in. If you’re not resolving issues found during rounds and it’s not efficient, you are not going to get buy-in from the nurses performing rounds. What accomplishments can be reached through effective rounding? When you’re rounding on the floor, you’re identifying issues, concerns and problems that could be related to the hospital environment, cleanliness or safety. You’re also fielding patient complaints and supporting communication among caregivers. You learn about these issues and you work to resolve them, ideally before they become patient satisfaction or safety issues. There are times when you learn about an issue and there is service recovery on the back end. There was a problem and you’re able to fix it. That can create a very positive outcome for a patient and the ability to provide service recovery is huge for a hospital. It’s a process that can be helped by an effective, planned and well-thought-out rounding process. Hospitals are large organizations, some of which have thousands of employees and communication is often a huge challenge. Often, there is a large gap between staff-level employees and senior management that results in a failure to fully explain new initiatives to the different departments and functions that make up a hospital. Rounding ensures the lines of communication are open so that this information can be shared, which is critical to creating a strong organization. How has the process of rounding changed? There was a time when rounding was a very siloed process among certain leaders in certain departments. Rarely was it a cross-functional activity where you had different departments going into a room and communicating with each other. Multi-functional, multi-disciplinary rounding has become much more prevalent, along with the frequency of rounding. Technology has been a big part of making the process more efficient. Automation allows those findings that took a series of meetings and phone calls to resolve and made the resolution process much more streamlined and focused. What is the idea behind comprehensive rounding? You can take all the disparate rounding functions that are happening throughout your organization and consolidate them into one solution for easy automated data collection. 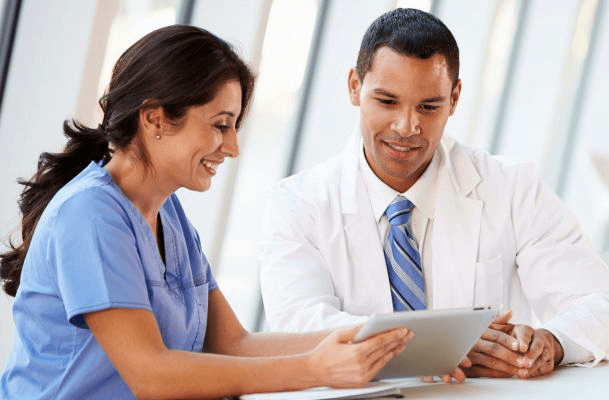 The idea of comprehensive rounding is one technology platform where you can round for patient satisfaction, environment of care, life safety, nursing, lab, pharmacy or other areas. You’re able to track and trend those data points and find ways to improve. Having it all on one platform is huge when it comes to the data behind it. Data is the key to improving. If you’re just performing rounds and you’re not solving problems, or tracking how you’re doing, you’re not going to improve. The goal should be to use an internal rounding process not as a guide to how you’re doing, but rather as an attempt to improve key indicators such as patient outcomes, readmissions and patient safety and satisfaction scores. Those are things you should care about as a hospital and things that will improve your HCAHPS results.